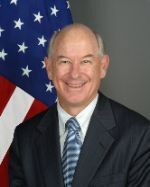 Assistant Secretary of State for Public Affairs Philip Crowley said at a news conference last week that the United States values Turkey’s role as a “bridge between the between the west and the region”, and that Turkey and the United States have a close dialogue on issues regarding Iran, Syria and Turkey’s broad efforts towards peace in the region. This week, Under Secretary of State for Political Affairs Bill Burns will also travel to Turkey as part of his tour to Lebanon, Syria and Azerbaijan from February 16-19. The visit follows a meeting between Secretary of State Hillary Clinton and Turkish Foreign Minister Ahmet Davutoglu at the London Conference on Afghanistan. During his visit to Turkey, Under Secretary Burns will meet with senior Turkish officials pursuant to the 2006 Shared Vision framework enacted between the two countries.